Death of a Pancreas: Opinions, Please! A lot of you wanted the shirt to reflect our battle against T1, so after some suggestions, this is what Fred put together. Let me know what your thoughts are on this design. Wendy suggested setting up an Etsy shop to sell the shirts, but when I checked them out, it says you can't sell things on Etsy that are made by someone else. So does anyone have another idea? This is all totally new to me, so I'm not sure how to go about setting up something where people can submit their order. I was thinking that people can send the money through Paypal (I already have an account and just email me the order). Fred and I were also thinking about how we would figure out the shipping charge. We don't want to just charge a flat rate because I'm sure some people will order 1 shirt, and some will order a whole bunch more. We are not out to make money on this, but of course we don't want to lose money either. So we were thinking that you would submit your order and pay for it through Paypal, then we would find out how much it would be to ship it, let you know and you would submit another payment for that. As soon as we have the money for the shipping, we would send it off. Of course, this asks for a great deal of trust on your part, and I understand you have no idea who I am except for what you read on my blog. So if anyone has a better idea of how to handle the order/charge/shipping process I am all ears. Or all eyes, would be more accurate I suppose. I like it! I think it looks great! I'm fine with going the paypal route. Sounds like a lot of work on your part, though. Unfortunately, I'm still new to all this so I don't have any good ideas on making it easier! I appreciate all your work and am excited to 'bring diabetes to light'! You may certainly add me to your blog roll! Thanks for checking us out! I'm on a quest to find blue bracelets that I could give to Avery's class in honor of the day... thought that might be a good way to involve her friends while raising awareness! But I think PayPal is a good idea...would just like to figure out a way so that it wouldn't be so much work for you. Thanks for stopping by my blog. The shrimp do come that big. These are the size of your little finger. Sorry you don't like seafood. :( Thanks for keeping me up on the t-shirts. It's amazing what people think we do to "give"our kids diabetes. First off- you don't like seafood? It's like we were separated at birth! I REALLY like the back of the shirt. My only thought is, everyone in my family, (they are all really opinionated,and are speaking from a standpoint of those who have NO IDEA what the circle means,) thinks that it should say World Diabetes Day, or World Diabetes Awareness,or something, under the circle. So that those who don't ask will know what we are standing up for. I'm torn. I like to keep it simple...what you have is awesome to me...but I do see their side of it. I thought about that too Meri, but I do really like the simplicity of it. I think we just need to realize that whatever we do decide, we're not going to be able to please everyone. And I'm really starting to wonder if you are the sister I never had... we totally need to get together and not eat seafood or something. I forgot to add that I checked out cafepress, and it's pretty cool, the only thing is that it will probably end up costing people a lot more money per shirt (approx. $25 compared to $15 or less from our guy - that second price depends on our order size, of course). 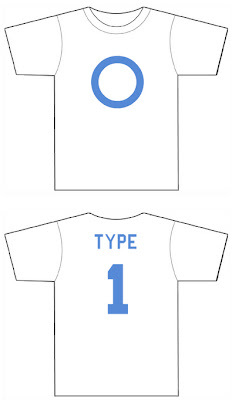 I like the Type 1 on the back.....just the simplicity of the blue circle on the front may cause someone to ask questions! As far as payment, whatever works best for you! How about flat rate shipping boxes from the USPS? They will even send them to ou for free. They come in all sizes. That's what I use when I ship to Wendy.